Beckhoff Automation (Shanghai) Co., Ltd. 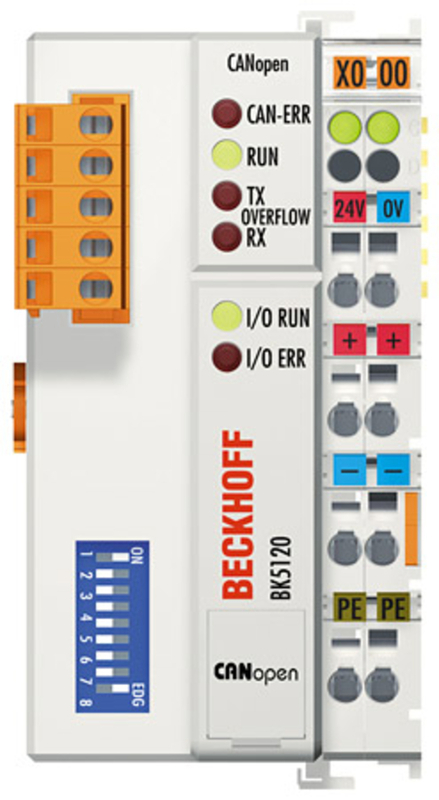 The BK51x0 CANopen bus coupler family connects the modular and flexible Beckhoff bus terminal system to a CANopen network. The bus couplers supply up to 255 electronic terminal blocks for any type of signal. Different voltage groups can be set up to fully replace the mechanical terminal blocks. The system ensures that control cabinets and terminal boxes are constructed more economically. Using the four-wire terminating system, all of the usual sensors and actuators with different signal types can be connected directly without other connection systems. This significantly reduces costs involved in controller design and saves space, material, work and hence money. There are several different types of CANopen bus couplers available, ranging from low cost and economy versions with reduced signal numbers to the standard coupler with full functionality. A fully IEC 61131 programmable version (BC51x0) for data pre-processing and local controls is also available. Parameters can be stored in non volatile memory. Flash upgradeable firmware gives easy access to new features.